My husband loves peanut butter. He eats it on all kinds of things. His favorite kinds of desserts are those that have peanut butter in them. 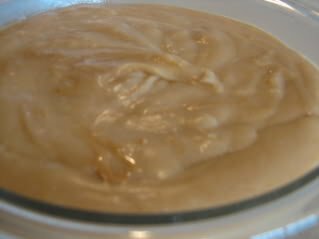 I saw a recipe several years ago in Southern Living magazine for peanut butter pudding. I saved the recipe and added it to my stack of recipes to try. Well, my stack of recipes to try is quite large and many recipes get buried away never to be found again. Or at least not found for a long time. This recipe was one of those. I was recently looking for another recipe and came across this one again. I decided that I needed to try it soon before I forgot about it again. So, the other day I had some milk that I needed to use up and thought it was a perfect time to try the peanut butter pudding recipe. My kids were thrilled with the idea of peanut butter pudding. We all loved this recipe. If you really like peanut butter you will enjoy this recipe. I think it would be good with chocolate chips stirred in or serve it with chocolate pudding. A little scoop of chocolate pudding alongside this peanut butter pudding would be so good. Combine first three ingredients in a med saucepan. Gradually whisk in the milk. Bring to a boil over med heat, whisking constantly. Boil about 1 minute or until it starts to thicken. At this point the pudding will still be slightly thin. Turn heat off and add peanut butter and vanilla. Stir until well combine. The pudding should now be thick. Pour into a bowl and cover with plastic wrap directly over the warm pudding, this will help prevent a skin from forming on the pudding. Chill 2 hours. Serve. Yummy, we love all things peanut butter so I will have to try this recipe. I bet this would be good with chocolate shavings. We love peanut butter, too! I actually “Had” to finish up the peanut butter in the jar yesterday as there was just a little left so then we could open the new jar. LOL! Yummy looking recipe! Sounds yummy, unfortunately my hubby isn’t so fond of peanut butter, I know its so sad for me. Ha ha. If this is as good as your peanut butter cake, I’ll have to try it. Thanks for the recipe. Sounds good. I always have these ingredients on hand. I just found your blog and have to tell you I love it! I can’t wait to try some of your recipes! Just think of what you could do with this pudding, it could be a filling for a cake or cupcakes, it could be a parfait or a trifle! This is fantastic! My girls would love this and I would too! This sounds yummy, especially with chocolate chips added 😉 Thanks for sharing! Oh that sounds so good. I have not tried making my own pudding yet, but this is making me want to! Kind of upset wisked the whole time but I could feel the sugar sticking and burning to the bottom once the milk got to boiling the bottom was burnt and was a huge waste off food, black burnt pieces were floating all in it. IDK how to prevent this. Sugar was sticking before it even got to boiling. I tried to scape it all before it burnt but I couldn’t get it to stop making a film on the bottom of the pan. I am sorry that it did not turn out for you. I have never had that happen. I am guessing that they heat was too high to begin with. Made this and a batch of chocolate pudding to make peanut butter cup parfaits. This was sooo yummy, warm or cold. Thanks, I am so glad that you enjoyed them both. This was so easy to make! I was just a bit shy of 3/4 cup of peanut butter so I added some semi-sweet chocolate chips and it was a huge hit! This is also much more cost effective than the box of mix I usually do and also, I like that I know exactly what is going in the pudding. Love your recipes! I am so glad that you enjoyed it! And I love the idea of stirring in some chocolate chips! Chocolate and peanut butter are a great combination!